Northern Pass project director Samuel Johnson shows a cross section of the type of cable that will be used in the high-voltage transmission line between the Canadian border and Deerfield. The Site Evaluation Committee is holding adjudicative hearings on the project and will make a decision in September. Day 12 of Northern Pass adjudicative hearings in Concord. CONCORD — Developers of the Northern Pass Transmission project were told that now is the time to reach out to Plymouth and Franconia businesses that will be impacted by construction to bury portions of the high-voltage line from the Canadian border to Deerfield. The $1.6 billion project would bring 1,090 megawatts of Hydro-Quebec electricity into New England along a 192-mile route with about 60 miles buried mostly through the White Mountain National Forest to Bridgewater. Northern Pass officials said Friday letters were sent to more than 300 affected businesses almost all along the buried section of the line, but acknowledged they are about to take a more aggressive approach. Many businesses in Plymouth sent the Site Evaluation Committee letters last month saying the disruption from burying the 1,090 megawatt transmission line under Main Street would devastate their businesses. Site Evaluation Committee member Christopher Way, Deputy Director of the Department of Resources and Economic Development, said an aggressive outreach to businesses is lacking. Eversource Vice President of Engineering Kenneth Bowes said they are starting now, sending out letters and have hired Louis Karno and Company to handle public outreach and relations. The company handled public relations for the recent reconstruction of Concord’s Main Street. Bowes said the developers are working aggressively on a draft construction schedule they hope to finish soon. He said the outreach will be much more aggressive over the next six to eight weeks. Way noted that businesses in Franconia would face similar disruptions, and places like a bed and breakfast could face significant challenges. Bowes said he understands and noted there is the opportunity to work with bed and breakfasts particularly in the North Country to house project workers who will need a place to stay. He said the company will also provide vouchers for workers to eat in area restaurants. The potential for housing and feeding 1,000 workers presents some challenges, he noted, saying the goal is to cut down on travel time for workers. 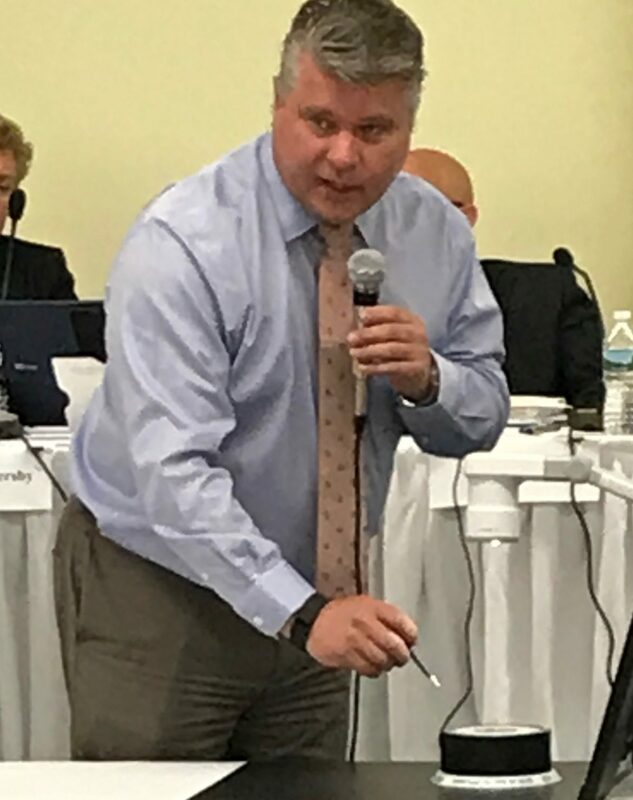 Bowes and project manager Samuel Johnson reminded the committee that both Franconia and Plymouth have not responded for some time to company requests to meet and discuss the project with an eye toward reaching memorandums of understanding. Johnson used the traffic circle in Plymouth as an example saying they could do construction over a quiet weekend, but would need town approval for detours over town roads. But he said conversations with the town ended abruptly when town officials said they believe the project should go down I-93 and no other route. Bowes noted construction to bury the line through a Franconia intersection with town land along one side could mean little disruption for town residents, but they need to talk to the town and have not had contact for 18 months. Developers noted 28 letters were sent in March to communities seeking to work together to develop memorandums of understanding that would include such things as work hours, traffic control and special events or areas that should be avoided. Northern Pass has two MOUs with Franklin, which was completed earlier, and Lancaster, and Johnson said 13 communities are in discussions with project officials. But there has been no response from 14 communities, he noted. Julia Frayer of the London Economics International LLC, who produced a report on the project’s cost-benefit and local impact for Eversource, will testify next week when hearings resume Thursday and Friday. The Site Evaluation Committee is expected to make a final decision in September and Eversource officials said it will take between two and three years to construct the project once the needed approvals are secured.